When you take a look at the stats for the State of Ohio, you will realize we have 3 of the top 5 counties covered. Many of our hunting properties are located in Tuscarawas County which has bragging rights for the top deer kill for the last several years. Our other counties are Coshocton and Guernsey, which are still in the top 6. Ohio hunters harvested a record 182,169 deer during the 2016'-2017' season. The harvest included 82,725 taken by bowhunters. Your whitetail hunt will take place on private land that we own, lease & manage. Our land offers some of the best whitetail deer and wild turkey hunting around. We work all year round at wildlife management to be able to offer you a great hunt at a fair price. We are a fair chase hunting operation, but as you know, no hunt is a guarantee. We do work very hard to make your hunt a very enjoyable and successful one. Our land has a 125" or better rule and has had for the last 9 years which means larger deer and a better hunting experience. We are a bow-hunt only outfitter so the best time to hunt is Oct. & Nov. With no gun hunting, deer are not pressured during gun season, therefore late season bow hunts over our food plots are still very successful. Hope to see you this coming season. You'll have a great experience. Come and enjoy. Here at Ohio Rut-n-Strut Outfitters we also specialize in spring turkey hunting. We are also avid turkey hunters. We have hunted turkey all over the country and are proud to say this area is one of the very finest places to hunt. It's non stop action. Ohio has between 185,000 & 200,000 birds est. from O.D.N.R. We offer hunts in Tuscarawas, Coshocton, & Guernsey Counties. Ohio hunters harvested 26,451 wild turkeys for the 2013' spring turkey season. We have several natural ground blinds to hunt from along with pop up blinds. We have several gasline and powerline right of ways to hunt. Turkeys love to strut there stuff in these locations. Whitetail deer hunting in Ohio is booming. Record-breaking harvests and trophy bucks are common in this state. A notable trophy buck was 291-2/8 taken in Adams co. 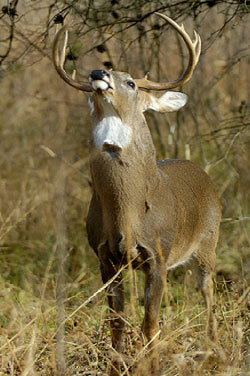 Many believe that Ohio is the state for trophy bucks at this time in deer hunting history. It is hard to argue with the results, with several of the largest bucks in the world were taken in Ohio during the past few years. Ohio's deer population is not distributed evenly across the state, although big bucks have been taken in every county. The best deer hunting population can be found in the central to northeast portions of the state and it is sparser in the northwest. Finally, not only are the deer plentiful and large, but you have a lot more time for hunting in Ohio, with deer hunting season that starts in October and runs through January. All of these factors add up to make Ohio one of the best places for deer hunters in the USA. This is all very fitting for a state whose most enduring symbol is the Ohio Buckeye tree, named so because its nut resembles the shape and color of a deer's eye. Again thanks for looking. View our Trail Cam Pics here!